Nvidia is reportedly courting phone maker-meets-processor manufacturer Samsung for a 2020 line of RTX desktop graphics cards built using Samsung’s 7-nanometer (nm) transistor process. This comes from Japan’s My Navi News, claiming access to Samsung sources and information. The processors will be developed using Samsung’s extreme ultraviolet lithography (EUV) process, which uses a plasma laser to drive silicon material into 7nm transistor structures. Samsung started producing 7nm processors using this method in October 2018, which Tom’s Hardware reports is ahead of its promised early 2019 launch schedule. Nvidia’s latest graphics architecture, Turing, is built on Taiwan Semiconductor Manufacturing Company’s (TSMC) 12nm process, and the firm was reportedly slated to build its 7nm RTX graphics processors on TSMC’s matching silicon. The switch could be due to Samsung being further along in its EUV plans than TSMC and other competitors, like Intel. Of course, ARM has several processors based on its 7nm chipset designs on the market already, particularly from Apple (A12X Bionic) and Qualcomm (Snapdragon 855 and 8cx). With 7nm processors driving its graphics cards, Nvidia can either produce new cards with lower power consumption overall at the same performance level or – more likely – use the lower power draw of the 7nm process to pack in even more performance at the relatively same overall power draw of today’s cards. 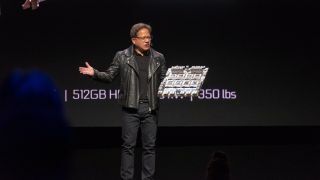 Here’s to hoping Nvidia has more to say about 7nm processors during its CES 2019 keynote.